Whip up batches of soft serve ice cream crafted to the perfect cool taste and creamy consistency with this Carnival King sugar free vanilla ice cream mix. A staple at any fair, midway, or concession stand, this frosty treat that counters the summer heat will boost your profits and delight your patrons! 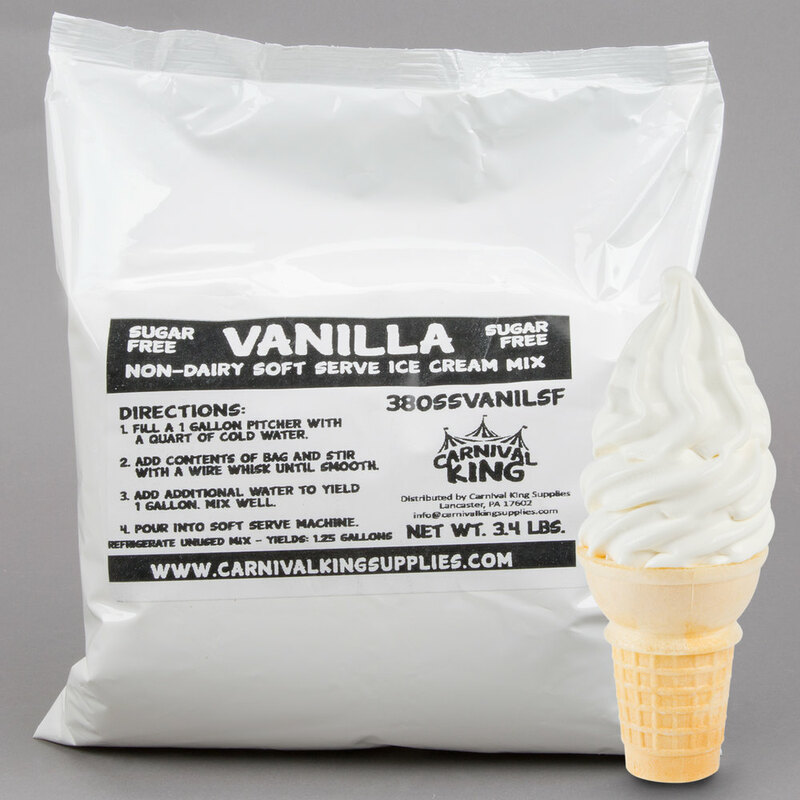 Stock your ice cream shop with this Carnival King mix that yields 1.25 gallons of liquid mix per bag. Soft serve ice cream made from this mix is a sweet end to any meal at your buffet-style restaurant or event. Simply mix with water and pour into your soft serve machine for fast, consistent results. Since this dry non-dairy mix requires no refrigeration, you can free up valuable freezer space and keep your operation in good supply! Carnival King is dedicated to serving each patron like royalty with smooth and sweet ice cream prepared from this premium mix. This mix is blended with air in your soft serve machine for light and soft, melt-in-your-mouth texture, and infused with creamy vanilla taste for the ultimate refreshment! One of the highest demanded flavors, vanilla-flavored ice cream swirled high atop a cone will be an eye-catching, enticing top-seller at your venue. Add sugar free vanilla ice cream to your menu, and even your patrons with dietary restrictions can enjoy. To use, fill a 1 gallon pitcher with a quart of cold water. Add the ice cream mix and stir until smooth. Add additional water to yield 1 gallon, stir, and pour into your soft serve machine. Refrigerate unused mix.